Acting Father Ronnie Frost and Hawick Cornet Ali George. Hawick Cornet Ali George struggled to put into words how it felt to lead his first cavalcade at the weekend. The 24-year-old, appointed a week ago on Wednesday just gone, led 162 followers to Bonchester Bridge on Saturday to be greeted by a huge number of supporters on foot. Cornet Ali George leads the cavalcade into Bonchester. Blessed with glorious weather, he and Hawick Common Riding’s so-called big eight paid a visit to residents at Weens House care home before leading the horses back to Hawick. “It was an amazing feeling to lead my first rideout,” Ali said. “It was great to see so many supporters out watching us. Everyone was making the most of the good weather, I think. The sunshine continued again on Tuesday for a cavalcade of around 50 to Cogsmill. Hawick ladies Amy Scott, Niamh Sharp and Ava Scott. The principals were welcomed to Cogsmill Hall for refreshments and to meet residents. The horses will leave Backdamgate at 1pm, arriving at Roberton at 3.15pm. 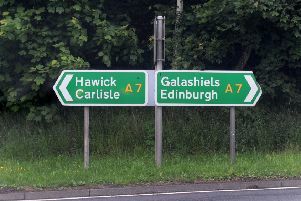 Leaving at 5.15pm, the cavalcade will arrive back at Hawick Moor at 7.20pm, then Tower Knowe at 8pm. The next rideout to Lilliesleaf follows on Tuesday, with the cavalcade leaving Backdamgate at 2pm and arriving in Lilliesleaf at 4pm. The horses leave again at 6pm and will return to Tower Knowe at 8pm. Riders Serena Dale, with Robin and Joe Crawford. The junior ride with the cornet will be held on Thursday, May 18, leaving from Common Haugh at 6.30pm. Rosettes will be presented to all riders taking part, and there will be a prize for the best turned out rider and pony judged by silver jubilee acting father Jim Hogg. Other common riding engagements next week include a concert in the town hall on Wednesday, May 17, from 6.30pm and the Bright Eyed Daughters’ Association’s annual dinner on Friday, May 19, at the Mansfield Park rugby club. Keith Middlemiss and Davie Blair enjoy a rest at Bonchester. Frankie Cromaghty and Georgie Bell leaving Hawick for Bonchester.